Playing the ancient Chinese game of go is among the tasks that awaits a powerful new cluster of Macintosh G5 computers set up at UCSC to tackle complex problems in physics and computer science. The cluster of 36 dual-processor Apple Xserve G5 nodes, housed in the Baskin Engineering Building, was provided by the Hierarchical Systems Research Foundation (HSRF). 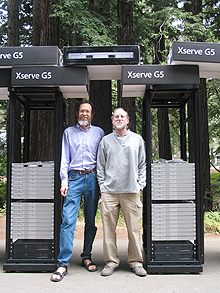 The foundation, established by UCSC alumni David Doshay and his wife Aviva Garrett, bought the computers for use in collaborative research. Doshay, who earned his bachelor's and master's degrees in physics at UCSC, worked with professor of computer science Charles McDowell and others to get the cluster up and running. Doshay is also working closely with John Donohue, a graduate student in physics, who will use the cluster for research on magnetic phase transitions and protein folding. Professor of physics Peter Young, who was Doshay's adviser for his master's thesis, will also be using the cluster for his own research. Doshay said he plans to add more nodes to the cluster over time to increase its computational power. "Even 72 processors is limiting for these kinds of problems, and there is plenty of room in the racks for expansion," he said. McDowell and his students are developing the software infrastructure for the cluster and working on a go-playing program. "The idea was that the go project would serve as a warm-up exercise for the physics project, because it has similar needs for parallel processing. The go project is taking on a life of its own, though, which is kind of fun," McDowell said. Although the rules of go are simple, the game has proven to be much more challenging to computer scientists than chess. "Computer go is an extremely difficult problem," Doshay said. "People have been working on it for 30 years, but there has not been nearly the progress there has been in chess. In chess, it's now commonplace to have programs that play at the level of grand masters, whereas the best go programs now are at the level of a casual amateur." Go is played on a board with a grid of lines on it, and two players alternate placing white and black stones at the intersections of the lines, trying to surround the largest area of the board with their stones, and capturing their opponent's stones by surrounding them. The first recorded reference to go is in the Analects of Confucius from the 6th century B.C. "On the surface, it seems simple, but it's very complicated to play strategically," McDowell said. "Chess is actually simpler because there are fewer options. In go, the number of options you have to consider is huge." On the physics side, Doshay is interested in a broad category of problems called multiple length-scale phenomena, an example of which is seen in magnetic phase transitions. The properties of a magnet are determined by the behavior of atoms aligned together in groups called domains, which interact over a range of length scales, from atomic to macroscopic. Magnets undergo a phase transition and lose their magnetization when they are heated above a certain temperature (called the Curie temperature). Doshay and Donohue are studying the behavior of magnetically aligned domains near this phase transition point. Modeling this kind of phenomenon is one of the most active areas in physics and applied mathematics, and it requires the kind of computational power offered by the new computer cluster. But Doshay didn't want physics graduate students to be saddled with developing the computer infrastructure needed for the project, so he enlisted McDowell and his students. "The software infrastructure we're developing is intended to make it easy for someone from another field, like physics, to program the cluster to do what they need to do--it's all about ease of programming," McDowell said.